The game’s afoot at the Festival Theater in Niagara-on-the-Lake, Ontario. Sherlock Holmes is on the case in The Hound of the Baskervilles, one of the most celebrated literary mysteries of all time. The play opened at the Shaw Festival last week and runs through October 27th. This Hound never takes itself too seriously. It is very witty and, at the same time, maintains the suspense involved in the mystery of what really happened to Sir Charles Baskerville on the moor, and what the nature of the hound really is. Adapted by R. Hamilton Wright and David Pichette, the tongue-in-cheek humor adds spice to the mystery in this nearly three-hour production. 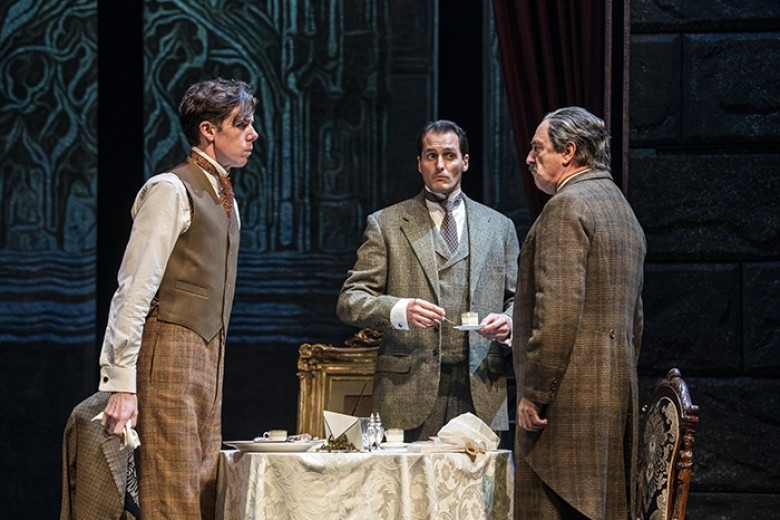 Tall and slender, Damien Atkins makes a fine Holmes, operating almost exclusively in his own head, talking down to others, and blisfully unaware that his crass insults to Dr. Watson are the least bit hurtful to his friend. He is easily forgiven, as his friend is very much aware of Holmes’ weaknesses, which the detective does not shy away from. Mr. Atkins moves with an awkward grace as he expounds on his theories and the scientific evidence to back them up. He quotes famous poetic phrases but incorrectly attributes the authors. They are almost always by Shakespeare, who he derides as a mere poet. Only science and the art of detection interest the great detective. Mr. Atkins has two fine comic turns in the mystery which will not be revealed here so that those unfamiliar with the story can work them out for themselves. Ric Reid plays Dr. Watson as something of a foil to Holmes, while at the same time revealing his own courage and warrior spirit. After all, he was in the war in Afghanistan. (The story takes place in 1890. In the recent BBC production of the mystery, the story is updated to the 21st Century and Dr. Watson has returned from the war in Afghanistan. History does indeed repeat itself.) 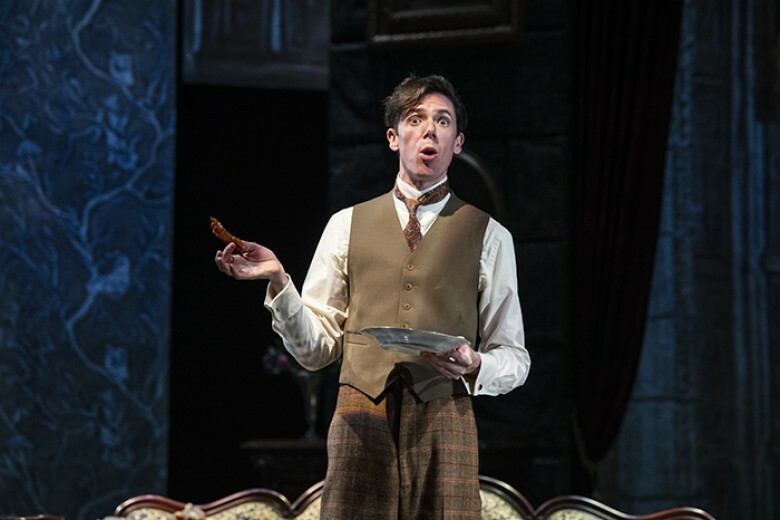 Mr. Reid scolds Holmes as only a true friend can and expresses glee when given the opportunity to show his stuff. Well played. Kristopher Bowman plays the cowboy Canadian Sir Henry Baskerville, aka Hank, who inherits Baskerville Hall and the estate upon the death of his uncle, Sir Charles. Mr. Bowman seemed rather stilted in the beginning of Act One but warmed to the part and became more relaxed in the role as the play progressed and he began to court the lovely Beryl Stapleton. Natasha Mumba is very fine as Miss Stapleton, who is said to have powers beyond her ability to captivate the men in her circle. She flirts with Sir Henry, but just enough to keep the fire burning. Her goofy brother Jack, the naturalist, is well played by Gray Powell. He is the perfect nerd. Claire Jullien shows her range in the double role of the witty and flirtatious Mrs. Hudson and the dour, grieving Mrs. Barrymore. Patrick Galligan, Cameron Grant and Graeme Somerville round out this fine diverse cast. The fascinating projections on the backdrops around the stage are designed by Jamie Nesbitt. They flesh out the elegant sets (designed by Dana Osborne) of 221b Baker St., Baskerville Hall, train stations and the moor. They are very effective as we see smoking chimneys in London, trains rolling through the countryside, birds flying on the moor, and a huge fire burning in Baskerville Hall. The descent by Holmes and Watson into the basement of the Hall is a delight. I enjoyed the play very much, as did my companion. I am familiar with the story, so there was no mystery in it for me. Still, I was engaged from beginning to end as the characters, plot, and special effects (there's a puppet, too) unfolded in this elegant and witty production. 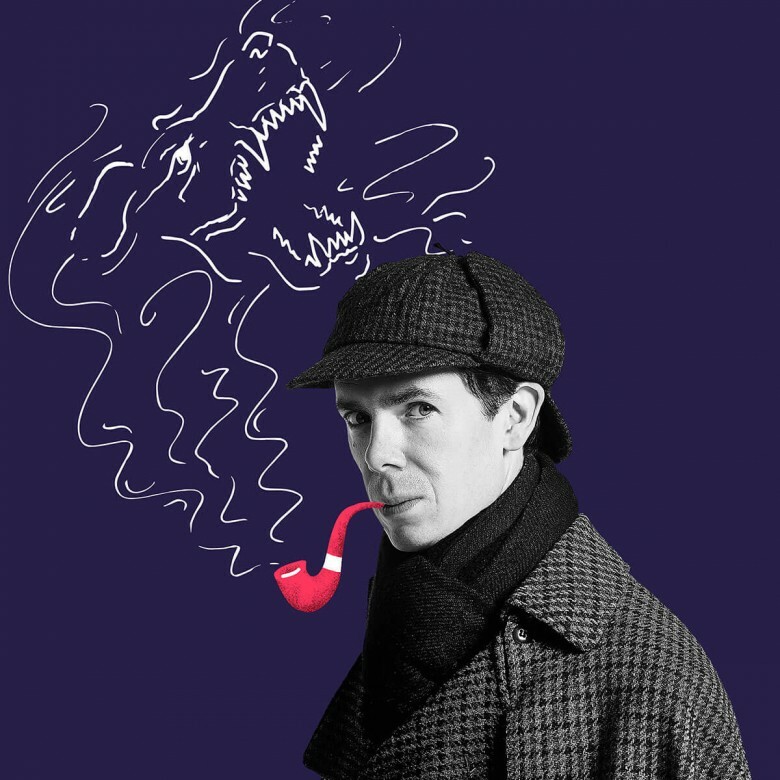 The Hound of the Baskervilles is directed by Craig Hall, who has put together a fine cast and creative team that are more than up to the task of keeping the audience in suspense as well as tickling our funny bones throughout the play.